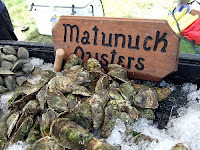 The Beantown Bloggery: Anyone Had Matunuck Oysters Before? There was an interesting article in the Globe recently about an increase in oysters coming in from Rhode Island. Many of you know I'm a huge fan of oysters - B&G is one of my favorite restaurants to frequent and I definitely don't go there enough. But, I don't think I've ever had a Matunuck oyster. In this frigid season, Raso and other Rhode Island oyster farmers see their business boom as many growers in Cape Cod and Canada run out of oysters or stop working because of the ice. During the first three months of 2008, Raso gathered more than half of the 400,000 oysters he sold during the entire year. Rhode Island oysters tend to be briny and crisp. "But the flavor of the oyster will depend on the season," said Raso, the president of the Ocean State Aquaculture Association and a former fisherman. In the late fall and winter, as the oysters store up sugars to insulate themselves from the cold, they taste sweeter than during the summer, he said. That's just how I like my oysters - briny. That's why I like Hurricane Harbors. I'll keep an eye out for the Matunuck's the next time I'm out. I've also heard really good thing about Neptune's so I've been meaning to check that place out as well. 0 Response to "Anyone Had Matunuck Oysters Before?"